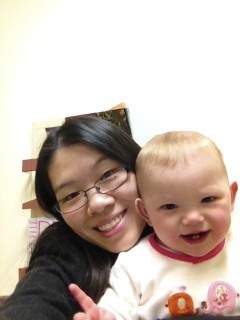 Phoebe Blogs: Finally got Synagis shot! Yay! After many phone calls over the entire month of November, Kayla finally got her first dose this week. Apparently there was confusion with which documents our nurse was supposed to send to get Medicaid approval. Hopefully, it all goes smoother next month. It's tough to get it because it cost about a $2,500-$4,000 based on Kayla's weight and only last 28-30 days. She has to get one every month until April to help prevent respiratory viruses. The nurse practitioner that we saw said that they have not seen any kids with RSV yet, so that's good. It's usually the worst around January/February. She had to get 2 shots...one in each thigh. 2 nurses did it at the same time, and it hurt. Kayla cried and has a dark bruise where one of them was. She weighed 18 lbs 8 oz and was 28.25 inches. I'm happy that she's putting on some weight and length now. She was stuck around 16 lbs for about 3 months, and I was starting to think she wasn't going to grow any more. How did her hair color turn out so light? She looks blonde in this picture due to the lighting. We're waiting to get the shot...entertaining a one year old for over an hour in a doctor's office is tough especially since I was trying to avoid her touching anything.